Read our Managing Director, Robert Marinelli's chat with Smart Property Investment on cladding and related matters. Robert Marinelli appointed to Property Council National Building Regulation Roundtable Committee. Congratulations to our Managing Director, Robert Marinelli, on being appointed as a member of the Property Council National Building Regulation Roundtable Committee. This committee manages the Property Council’s response to regulations affecting the property sector and ensures any building controls or government policies are reasonable, cost-effective and help drive innovation. The consultancy helps clients meet their building and development goals while ensuring all aspects of building compliance are met. In March this year, papers were filed in the Victorian Supreme Court alleging breach of contract by the Consultancy, among other listed respondents, regarding external paneling on Melbourne’s Royal Women’s Hospital. While the revisions to the building code announced late February 2018 ruled out the use of polyethylene-core aluminium cladding, there were no such restrictions at the time the hospital contract was awarded in 2005. The matter is now before the court, with a directions hearing scheduled for October 2018. For any enquiries, please contact the Philip Chun office in your state. The NCC 2016 Volume One Amendment 1 applicable to all States and Territories came into effect on 12th March 2018. These amendments relate to changes relating to fire safety in high rise buildings and evidence of suitability. 1. The introduction of a new Verification Method (CV3) for testing of external wall assemblies for fire propagation. CV3 references a new testing standard, AS 5113-2016 ‘Fire propagation testing and classification of external walls of buildings’, and in most circumstances requires additional measures (e.g. enhanced sprinkler protection) to mitigate the hazard presented by a combustible façade. 2. Revision of the NCC’s evidence of suitability provisions, including clarifying the application and language of A2.2, strengthened wording of the current options, and a new requirement to consider the ‘appropriateness’ of the evidence being presented to support the use of the material, product, design or form of construction. 3. Clarification of provisions, including provisions relating to external wall claddings and attachments, provisions that provide exemption to the non-combustibility requirements, and provisions that control the fire hazard properties of building elements. Full details on the regarding Amendment 1 can be downloaded from the ABCB website. For any assistance in interpreting these changes, please contact us. What does a certifier do? The NSW Government has passed reforms to the NSW building regulation and certification system. The reforms have been issued in the Environmental Planning Assessment Amendment (Fire Safety and Building Certification) Regulation 2017, published in early July 2017. The changes come into effect from the 1st of October 2017 and are part of the state governments response to the final report on the statutory review of the Building Professionals Act 2005, also known as the Lambert Review. The reforms cover a broad range of buildings through all stages of the construction cycle, including the design, construction, pre-occupation and post-occupation stages in both new and existing buildings. Requiring fire safety certificates and statements to be in an approved form. The Government is also working on a separate project to provide clear guidance on an accreditation framework for “Competent Fire Safety Practitioners”. At present there is no Government approved scheme in place for this function, which means in the interim it will be at the discretion of your certifier to determine who qualifies as a “Competent Fire Safety Practitioner”. The requirement for a “Competent Fire Safety Practitioner” to endorse the required fire safety system documentation provided as compliant with the relevant requirements. This means if builders, project managers and developers have an existing relationship with a company that has been undertaking their fire system design, the company will need to have someone accredited as a Competent Fire Safety Practitioner to endorse their designs. Mechanical ducted smoke exhaust systems. Does this affect your current project? If your Development Application (DA) or Complying Development Certificate (CDC) has not been issued by the 1st of October 2017, the above mentioned additional requirements will apply to your project. Class 2 and 3 projects where the Occupation Certificate has not been issued before the 1st October 2017, will, after the 1st October need a Fire and Rescue NSW inspection request at least 10 days prior to Occupation Certificate. The NSW Government is proposing substantial structural changes to the process of fire services design and commercial building certification. The changes are not cosmetic – they will affect what is documented for approval, designer suitability and involve more inspections and accountability for sign off at completion. The proposed changes have not simply copied other states by licencing most designers and installers, but seek to target fire safety components to achieve better quality design, approvals and completed construction. There is little doubt that for parts of the industry, the fire safety reforms proposed for New South Wales will take more time to document, approve and inspect. If carefully implemented, monitored and improved over the next couple of years, we at Philip Chun are optimistic that the changes will improve accountability for completed works and the quality of installed fire services in buildings. This will replace the current situation in New South Wales, where there are little or no controls over who designs or installs most of the fire safety systems in commercial buildings. For example, the person who installed your home theatre system may well have installed the smoke detection system in the high rise building you work in – because none of this work requires a licensed electrician. Industry bodies that represent Accredited Certifiers have been asking for change in this area for many years. Accredited Certifiers regularly face refusal by contractors to provide a copy of their license for fire safety installation and even some of the largest international companies only provide their qualifications and CVs to a certifier with bitter resentment. The proposed changes will address this ‘cartel’ type situation. The state government’s carefully crafted proposal should be a game changer if carefully implemented and policed. 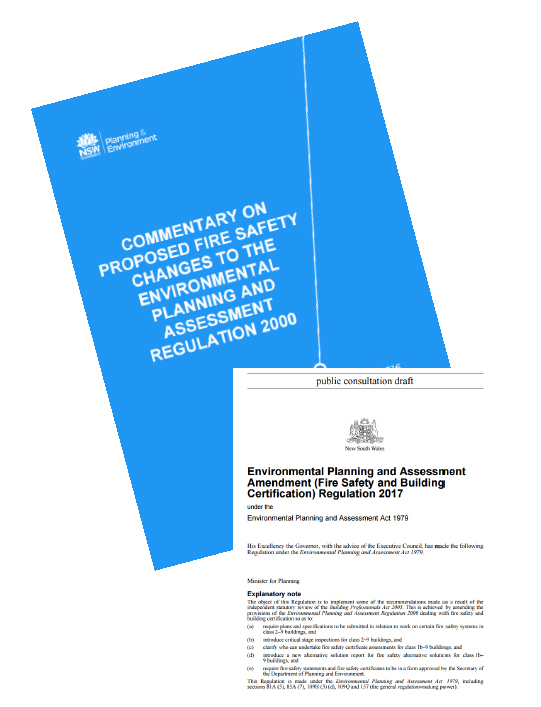 We have summarised the proposed changes (to legislation NSW Environmental Planning and Assessment Regulation 2000) and provided some comments below. Some of the proposed reforms require the use of a ‘competent fire safety practitioner’ (see point 2 below) and as such, the NSW Government is aiming to (i) clarify what it means to be a competent fire safety practitioner and (ii) create a co-regulatory accreditation framework, which recognises industry bodies and their accreditation schemes (that cover the fire safety functions that require a competent fire safety practitioner). Before the installation, extension or modification of relevant fire safety systems, the new regulation will require plans and specifications for fire safety system work to be endorsed (as compliant with relevant requirements) by a competent fire safety practitioner and submitted to the certifying authority. We at Philip Chun have recommended to the state government that this should be prior to approval; otherwise it could be abused and ignored by some. The proposed regulation will provide some flexibility around minor relevant fire safety system work associated with alterations and additions to existing buildings. We have recommended against this in our submission to the NSW Government, as we believe this will result in ‘a race to the bottom’ in terms of quality, as has been seen in Victoria. Two new critical stage inspections are proposed to the list of inspections under clause 162A of the regulation for Class 2-9 buildings. These relate to the fire rating of services penetrations and inspection of fire rated walls prior to covering. in the capability of FRNSW to resource their increased role and be consistent in their reporting. as the inspection will apply to new work to existing buildings, the temptation to require a fire system upgrade as part of the inspection report and going beyond the scope of the new work could have great implications for building owners. The proposed regulation will require a report to be submitted to the certifying authority for endorsement for all fire safety Alternative Solutions that apply to a Class 1b to 9 building development. The complying development certificate or construction certificate would not be able to be issued without this report and the certifier’s endorsement. This means those in the industry (architects, builders, project managers) will be working with competent fire safety practitioners in the near future. The new regulation will require the principal certifying authority (PCA) to be satisfied that all accepted fire safety Alternative Solutions have been constructed or installed in accordance with the associated Alternative Solution Reports. While this requirement is consistent with the existing responsibility of the PCA, the new regulation will clarify the PCA’s responsibility on Alternative Solutions. There is some concern that this crosses the line where Accredited Certifiers move from being an independent public authority, to that of a certifier of construction components. Submissions have been made to state government regarding these concerns. The NSW Government is now reviewing stakeholder feedback on the draft regulation changes. The regulation is expected to be finalised later this year. For further information on the regulation changes contact Rod Shepherd rod.shepherd@philipchun.com or go to DOWNLOAD PDF. The new Victorian apartment design standards, which will improve development quality, have been released for a final consultation round before being implemented later this year. The Better Apartment Draft Design Standards address issues raised through a comprehensive consultation process with the community, local government and industry. All new apartments will need to provide adequate daylight, storage, ventilation, energy and waste efficiency and noise minimisation. The design standards also address building setbacks, room depth, accessibility and open space. Community and industry feedback on the draft standards is open until 19 September 2016. Design guidance for Victorian apartments is minimal compared to other states. According to the state government, this has resulted in apartments being built that do not meet basic needs such as natural light, fresh air and storage. The lack of standard requirements for internal apartment amenity has resulted in some poor designs and inadequate long-term living environments. In May last year, the state government released a discussion paper that prompted consultation with the community, local government and industry regarding internal apartment amenity and potential future design. Almost 1700 survey responses and around 150 submissions were received on the discussion paper. Community survey participants ranked the key issues affecting apartment amenity by most to least important – identifying daylight, space, natural ventilation and noise as the top issues. The Better Apartments draft design standards have come about as a result of this consultation process. “The standards will need to be key consideration for developers and architects planning apartment buildings from 2017 and beyond.